In this post we will take a look at how you can manually Create a System Restore Point in Windows 10. In case of a problem on your computer, you will be able to make use of this manually created System Restore Point to restore your computer to its normal or stable working condition. 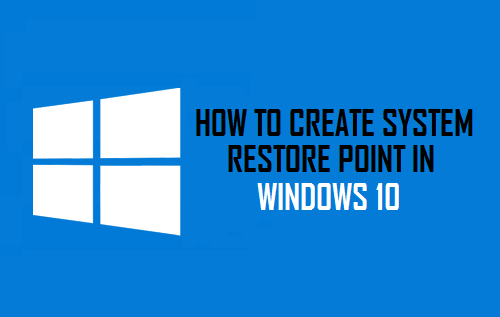 While Windows 10 operating system does create System Restore points automatically, having a manually created restore point will provide you with another option to restore your computer from. 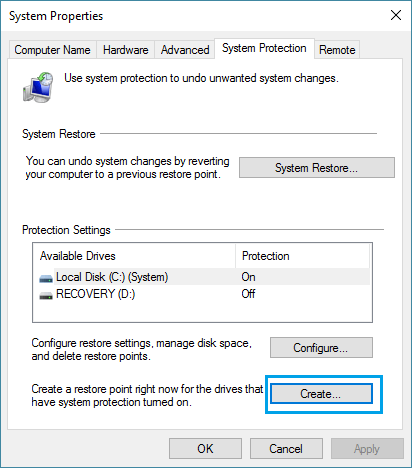 A system restore point can be defined as a saved record of your computer’s system files, registry files and settings at a given point in time. As mentioned above, System Restore Points are automatically created by your computer using a Windows feature called System Protection. This feature is designed to regularly save information about your computer’s system files, registry settings and also record previous versions of files. Additionally, System Restore points are also created automatically whenever the operating system detects major changes happening on the computer like Windows Updates, Critical Updates, installation of major software programs and driver updates. 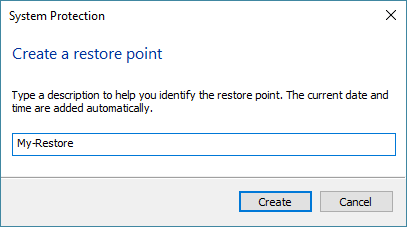 The object of having restore points available on your computer is to provide you with an option to take back your computer to the state it was in when the system restore point was created. This allows you to undo changes on your computer (in case they are not working properly) by restoring your computer to a good restore point. As the name indicates, System Restore only affects System files, Program files, Registry settings and other executable files on your computer, it has no impact on your personal files. To make this clear, you will not be losing 2 Weeks of work on Word or Excel files in case you decide to restore your computer using a system restore point that was created 2 Weeks ago. Follow the steps below to manually create a system restore point on your Windows 10 computer. 1. 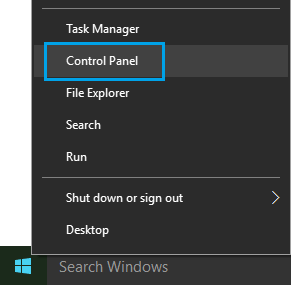 Right click on the Windows 10 Start button and choose Control Panel. 3. 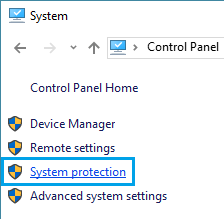 Next, click on System Protection, you will find this link located to the left on System Screen (See image below). 4. Once you click on system protection link you may see a popup asking you to enter your Admin Password, in case you are currently not logged in to your Admin account. 5. Enter your Admin Password in the Pop-up window. This will take you to the System Protection Screen (See image below). 7. On the next screen, enter the name for this Restore Point. In this case we are calling it My-Restore. There is no need to include a date in the name field, as this will be automatically generated by the system. 8. Click on Create and allow the system to create a System Restore Point. You will see a pop-up indicating that a system restore point is being created on your computer. 9. You will see a confirmation message once the process of system restore is completed. You have now created a System Restore Point on your computer. In case of a problem on your computer, you can make use of this manually created System Restore Point to restore your computer to working condition.